It just takes some time to learn how to use it. 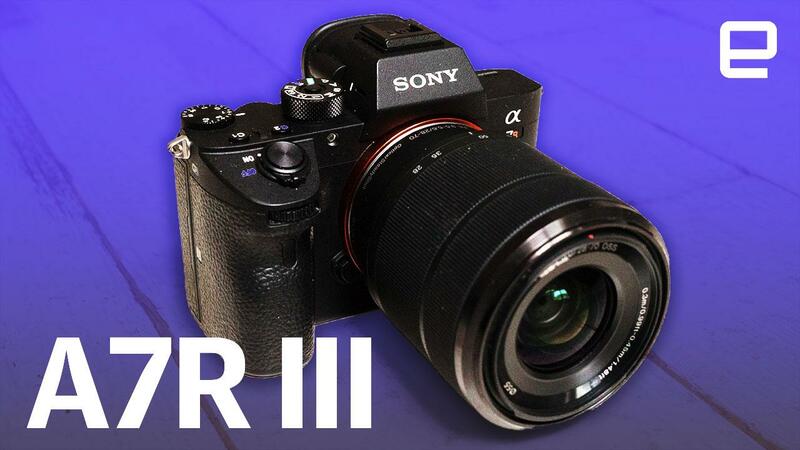 On paper, Sony's $3,200 full-frame mirrorless Alpha A7R III is a beast. With an ultra-high-res 42.4-megapixel sensor that can shoot bursts at 10 fps, you can capture landscape photos one day and sports the next. It also handles video like a boss, recording 4K without line skipping, and super-slo-mo 1080p at 120 fps. To find out if the performance measured up with the specs, I took it for a weeklong spin with high expectations and can report that the A7R III is the real deal -- provided you get to know it, first. Sony's full-frame, 42-megapixel A7R III is the king of mirrorless cameras, with category-leading resolution, low-light performance and video shooting capability. It also has an excellent electronic viewfinder and stellar autofocus capabilities with spot-on face detection and much-improved subject tracking. Battery life could be better and its menu system is still clunky, but this is nitpicking on an otherwise world-class camera. Be the first to review the A7R III? I own a first-gen Sony A7S and have access to an A7R II, so it's interesting to see how the A7 series has evolved. The A7R III is certainly larger than the last model, but it's not that much heavier (657 compared to 625 grams) and the extra size has made everything better. Borrowing from the more expensive A9, the A7R III has a beefier, deeper handle, something that might convince (some) Canon or Nikon pros to consider it. As some reviews have pointed out, though, the handle is a bit too close to the lens mount, making it hard to grasp the camera with gloves on. There are manual controls for everything on this camera, and the buttons and dials are largely the same as on the A7R II -- except for two major changes. The first is the addition of a touchscreen, which is dedicated to changing the focus region with just a tap. The other is a joystick, which offers more convenient focus point adjustments when you have your eye to the electronic viewfinder (EVF). Speaking of, the EVF is both larger and has a higher resolution than the A7R III's predecessors. It's also impressively fast, though that's something to be expected on a high-end mirrorless camera nowadays. The bigger body allows a bigger battery with over twice the capacity of the last model, meaning you won't be sweating battery life (as much) on a shoot. However, you still get just 650 shots max compared to 1,840 on the A7R III's biggest rival, the $3,300 45.7-megapixel Nikon D850. The A7R III now has two SD card slots, compared to one on the A7R. Only the bottom slot supports UHS-II, for some reason, but at least there's finally UHS-II support. To best try out high-bandwidth 4K, I purchased a 128 GB UHS-II card, and let me tell you, those things are expensive (around $150 for the Lexar model I got). One of the perks of the A7 series is a full complement of ports, including headphone, microphone, HDMI, flash sync and micro-B USB. The A7R III ups the ante with a USB type-C connector, which can not only be used for speedy transfers, but charging as well -- handy for tethered photography (the micro USB port also supports charging). Having both standards is a welcome change for Sony, which hasn't always been so forward-looking with ports. Sony's menu system has always been confusing and while the A7R III is less of a mess, the sheer number of functions makes it easy to forget where things are. Luckily, you can program most everything you need into the four buttons (C1 to C4) or use the three Recall settings on the main control dial to change a wide range of things at once. To avoid any disasters during a shoot, you'd do well to learn the menus ahead of time and pre-program any functions you use often. The Sony A7R III uses the same sensor and has the same 42.4-megapixel count as its predecessor. As you'd expect, then, image quality is pretty much the same, which is to say, excellent. Thanks to new circuitry, though, you can gather those shots a lot quicker at 10 fps with the mechanical or electronic shutter. That's actually faster than the lower-resolution A9, which shoots 5 fps in regular shutter mode (albeit 20 fps with the electronic shutter). You're less likely to get out-of-focus shots, too, as Sony has drastically increased the number of autofocus contrast detection points from 25 to 425 (both cameras have 399 phase-detection points). With new circuitry as well, Sony says the A7R III focuses twice as fast as the A7R II. In the real world, the difference is obvious. Using the center-spot AF, focus is dead accurate nearly 100 percent of the time. The "Lock On" mode, which lets you track anything that moves, manages to keep focus unless something passes in front of the subject. RAW images are now captured at 14 bits instead of 12, and Sony has increased the dynamic range as well. That means you can crank up the ISO levels a bit more, because dark parts of an image are less noisy at higher ISOs. At the same time, its NR filters do a good job of smoothing any grain you do get. 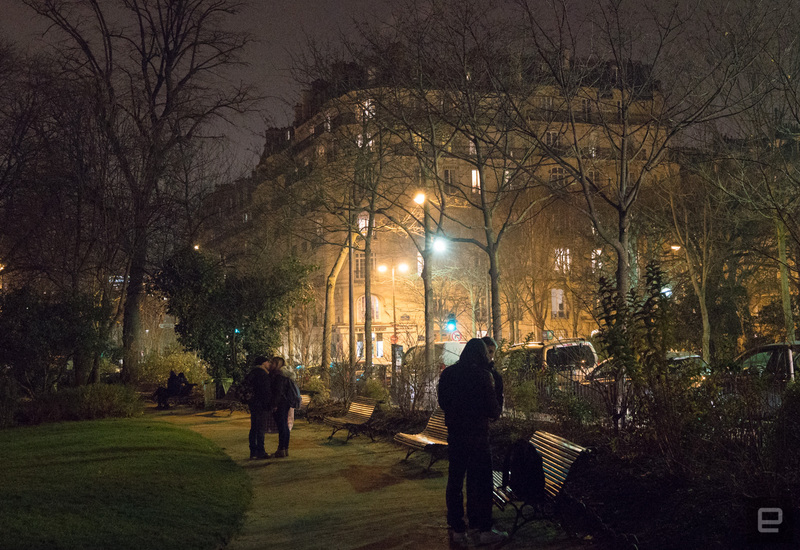 For me, shooting night scenes at ISO 12,800 resulted in good images, and usable ones at 32,000 to 64,000 ISO. That allowed me to get images like one below, shot at 32,000 ISO, that might have been blurry at a lower sensitivity. Sony's A7S II is still the low-light champ, especially for video, because it squeezes a quarter the resolution (12.2 megapixels) into the same size sensor. On the other hand, the A7R III keeps getting better at handling low light, and if you reduce an image from 42.4- down to 12.2-megapixels, that's going to substantially reduce the appearance of noise, too. Sony promised and has delivered on better JPEG images too, with more true-to-life color accuracy and less aggressive sharpening than before. I tend to shoot both RAW and JPEG images to have a backup, and for one particular photo, I was comfortable using a JPEG in place of a glitched RAW image. With 8-bit (16.8 million colors), Sony's A7R III may not support 10-bit video and a billion colors like Panasonic's GH5, but it's still arguably the best full-frame, mirrorless camera for video on the market. There are two 4K shooting modes: One at full-frame with some line-skipping, and the other that uses APS-C cropping with a full sensor readout. The latter produces a better image if you peep close, but if you want full-frame depth of field, you'll have to settle for slightly more noise and moire. Personally, I could barely see the difference. Continuous focus worked very well on the A7R III, locking solidly on subjects in decent light. It was less accurate in dim illumination, but the results were still acceptable. Focus speeds when shooting video are considerably faster than before. Suffice to say, it's much better than my A7S, so Sony has made some big improvements over the last three years. All the 4K video I shot in dim, drizzly conditions at 100 Mbps in standard mode was sharp with rich, accurate colors. If you'd rather sort out colors in post-production, you can shoot in the neutral S-log 2 mode, included with the A7R III for free (Sony used to charge for it). Sony also offers a new shooting mode called Hybrid Log Gamma (HLG) that's also found on the Panasonic GH5. That saves metadata so you can easily create HDR-ready video. As before, Sony gives video shooters both microphone and headphone inputs, audio levels, histograms and pretty much everything else you need. The five-axis in-body stabilization, coupled with lens stabilization, makes handheld video about as steady as it can possibly be. The extra heft also helps in this regard, I find. Overall, the A7R III is about as close a pro video camcorder as you're going to get in a mirrorless camera. For someone like me who shoots my own photos and video, the Sony A7R III is an awesome, multi-pronged tool. Yes, it should be for $3,200, but just a couple of years ago it would have been hard to believe that a camera with nearly medium-format resolution could be so good at video, too. On top of that, the A7R III is so unbelievably fast, both in frame rate and autofocus speeds, that it's even feasible to use it for action or spots. Its only real rival is the superb Nikon D850, and which you choose may depend on whether you prefer mirrorless or DSLR. DP Review called them "genuinely two of the best cameras the world has ever seen." With a new battery, touchscreen and joystick, and USB-C port, Sony has solved many of the problems of its predecessors. The result is a camera that not only shoots great images and video, but also handles extremely well. Sony still has some work to do on its clunky PlayMemories app and sprawling menu system, but if you take a few hours to set it up, you can mostly avoid diving into the menus altogether. Otherwise, the A7R III is the best camera, mirrorless or otherwise, that Sony has ever made. In fact, it so good that it may give a lot of Alpha A9 buyers pause.